When people think about East Germany, they usually picture East Berlin. The Berlin Wall. The Plattenbauten. The DDR prisons. It was the largest East German city with a population of 1.2 million in 1988. But Berlin has moved on. The country has moved on. Though there are plenty of reminders of the time behind the Wall, the country is never content to stand still. Looking east, Leipzig and Dresden are the biggest cities and a great example of past and future. But there are plenty of smaller towns notable for their DDR past, unique architecture, and Sorbian population. Here are five East German towns worth a visit. 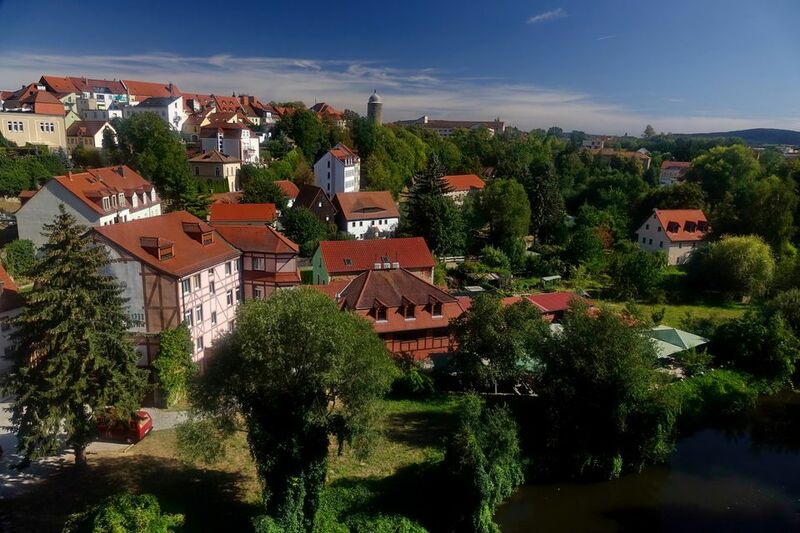 With medieval walls, a historic altstadt (old town) and several museums (dedicated to everything from senf and Sorbs), Bautzen is worth a stop. It's pretty, but beneath the prettiness is an unpleasant history under the DDR. The city was infamous during that time for its prisons. Bautzen I, nicknamed Gelbes Elend (or Yellow Misery) was an official prison complex, but Bautzen II was a secret prison used for prisoners of conscience. Bautzen I is still a prison, but Bautzen II has been made into a memorial (much like Berlin-Hohenschönhausen). Originally known as Chemnitz, this was the fourth largest city in East Germany. It was left in ruins after World War II and reconstructed in the emerging style of the DDR. Along with the ever-present Plattenbauten, they erected a sizeable 7 meter Karl Marx monument. The bust was promptly nicknamed Nischel (a Saxon word for head) by locals. By 1990, the Wall had fallen and the city re-emerged under its original name. The typical shopping centers now crowd the Altstadt but much of the DDR architecture still stands alongside modern structures, including the watchful eye of Karl Marx. Halle (Salle) is full of attractions. Castles like Giebichenstein Castle and Moritzburg add medieval elegance. Halloren Chocolate Factory is Germany's oldest chocolate factory still in use, and the Market square holds four impressive towers — a symbol of the city along with Roter Turm (Red Tower). Marktkirche is from 1529, St. Mary's Church is from the 12th century, and St. Gertrude's Church dates back to the 11th century. Also, look for the 13th-century statue of Roland. The University of Halle-Wittenberg is also here, the largest university in Saxony-Anhalt and one of the oldest universities in Germany, meaning there are plenty of cheap places to eat, drink, and dance. The Neustadt (known as HaNeu), is southwest of Halle (Saale) and is another fine example of a DDR city. Towering Plattenbauten line the S-Bahn lines and artistic details and murals set this town apart. This 1950s DDR factory town was first named Stalinstadt. Eventually, the name was changed to Eisenhüttenstadt (ironworks city) to reflect its industrial, not political, nature. Located in east Brandenburg (the state surrounding Berlin), it lies on the border of Poland. It was planned as a model workers’ community with plentiful Plattenbau (East German apartment) and job opportunities in the steel mill. The style was actually quite modern, designed by architect Kurt Walter Leucht. The city has since seen a steady decline. Its population is dwindling and jobs have all but dried up. On the city website, it appears the most exciting thing to happen is a visit from American movie star, Tom Hanks. Here — as in other sites on the list — you will find not a thriving town, but a life-sized museum piece to life in the DDR. Once a small Sorbian village named Gorelic, today's Görlitz has blossomed, then wilted, then flourished under the spotlight once again. Held at certain times by the Holy Roman Emperor, Kingdom of Poland, and Duchy of Bohemia, the town was largely forgotten under DDR rule. This served it well as some of its most beautiful buildings were left perfectly preserved. Buildings such as the 1913 Jugendstil Görlitzer Warenhaus (a department store in the city center). It was cast as the interior of the hotel in Wes Anderson's "The Grand Budapest Hotel" which showcased such spectacular features as original chandeliers and a stained-glass ceiling. Even older, Oberlausitzische Bibliothek der Wissenschaften is a magnificent library with over 140,000 volumes. It holds materials ranging from legal texts to natural sciences to historical literature.